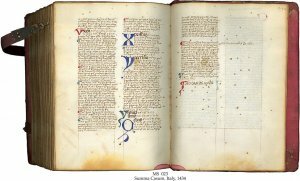 Description	 MS in Latin on vellum, Calabria, Italy, 1434 (text 3 ca. 1500), 241 ff. (-8), 19x13 cm, 2 columns (13x10 cm), 37-45 lines in a small Gothic book script by Guilgemus Nicolai de Campis (=Wilhelmus á Kempis), cleric of the diocese of Utrecht (text 1). Text 2 signed by Frater Franciscus Zena. Binding	 Calabria, Italy, mid 15th c., red-stained leather over bevelled wooden boards, sewn on 3 thongs, blindruled, 13 very small bosses. Provenance	 1. Written for the Observantine friar Brother Thomas de Bova, Calabria, Italy (1434); 2. Frater Franciscus Zena, Italy (15th c.); 3. Sotheby's 23.6.1987:80.